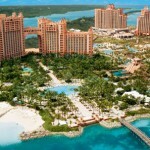 The Atlantis Paradise Island Hotel is a large resort located in Nassau, in the Bahamas. This hotel is a large castle with several aquariums and pools. This castle is a large pink building with turrets and towers. The rooms are located in the Beach Tower, Coral Towers, Royal Towers, Harborside Village, The Cove and The Reef. In the center of the group of hotels there is a coral reef. Price varies on type of room and is around 243€ per night, and around 25000€ per night for a Bridge Suite. The Royal Towers have several types of rooms, and guests will be able to stay in rooms with two queensize beds and rooms with a kingsize bed. These room have French balconies and terraces with views towards the bay and the resort. The Regal Suites have views towards the Caribbean and the hotel’s gardens. There is a large kingsize bed, two closets and a balcony. Each one of the Grand Suites has a kingsize bed, a bathroom with a jacuzzi and a balcony with a lounge. The Presidential Suite is located at the Imperial Club in the Royal Towers. These suites have several rooms and bathroom with jacuzzis, a living room with a bar and views towards the Caribbean. The Royal Suites have three rooms, several bathrooms with a jacuzzi and living room area with a bathroom and a lounge. The Suite Bridge is a large suite with ten rooms. There is a living room with a piano and gilded decorations. Each room has floor to ceiling windows. Guests that stay at these rooms have their own staff. The Coral Towers have several types of rooms. There are Guest Rooms with two queensize beds and Guest Rooms with a kingsize bed with views towards the resort, and the Regal Suites have a bedroom, a large bathroom, two balconies and a living room. The Governors Suite are located in the center of the resort, and have views towards the fountains. These rooms have a kingsize bed and a living room with several sofabeds and a balcony. The Presidential Suites are suites with a kingsize bed. Each suite has a living room with armchairs and sofabeds, and the balconies have views towards the resort. The Beach Tower has double rooms with views towards the casino and the Marine Village, the resort’s main street filled with boutique stores. Each double room has a bathroom and a balcony with a terrace. 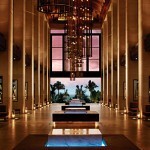 Cove Atlantis has some of the resort’s largest suites. The designer decorations and the private club are the hotel’s main features. The Ocean Suites have a large living room and each suite has a marble bathroom and a French balcony with views towards the ocean. The Deluxe Ocean Suites are larger and have closets in each room. The Azure suite are designer suites with a kingsize bed and a bathroom with a large bathtub. 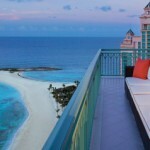 The balconies have views towards Nassau. The Sapphire Suites are another set of designer suites. Each one of these suites has a living room decorated with handmade art pieces, and the rooms have crystal decorations and marble bathrooms. On The Cove’s top floor there are two Presidential Suites. Each suite has two floors, two double rooms with a double bed, two bathrooms, a room with a desk and chair, a dining room, a living room with a multimedia hall and a terrace with views towards the ocean. The Penthouse Suite is decorated in a Bahamian style. The one floor suite has domed ceilings, three floor to ceiling windows, two rooms with bathrooms, a kitchen, a dining room, a room with a desk and chair, a lounge, a television room and a large balcony. This building has several studios. The Reef Studios are located near the beach and have a kitchen, a double room with a bathroom and a balcony. The Suites have a large double room, several bathrooms, a kitchen and a living room. The Penthouse Suites have two rooms and two bathrooms, a kitchen and a living room with floor to ceiling windows and a large terrace. The suites lead to the beach. Harborside Resort is a small village inside the main resort. The One Bedroom Villas have their own kitchen. Each villa has a double bed, a bathroom with a jacuzzi and a living room with a sofa bed. The Two Bedroom Villas have two double rooms, one of which has with a kingsize bed and the other one with a queensize bed. Each room has its own bathroom and the living room area has a kitchen and a terrace. The Three Bedroom Villas have one room with a kingsize bed and a bathroom with a jacuzzi and two rooms with a queensize bed and a bathroom each. Each villa has a kitchen, a living room with sofa beds and a terrace. The hotel has 19 bars and 21 restaurants. Most restaurants offer menus for kids. There are several cafés, pizzerias and juice bars where guests will be able to try fresh juices. Chop Six is a Chinese restaurant. The Café Martinique offers French pastries. Dune is a restaurant specializing in Asian and French dishes using some spices from the Bahamas. The Bahamian Club offers local dishes. Mesa Grill is a grill restaurant where guests will be able to taste Southern food and enjoy views towards Paradise Beach. Casa D’Angelo is an Italian restaurant. The Courtyard Terrace is a family restaurant known for its Mediterranean food. The Seafire Steakhouse has a selection of stakes. The Mosaic is a restaurant that serves international food. The Marketplace has antique decorations similar to those that could be seen at the ancient markets, and offers regional dishes. The family restaurant Seagrapes has a large kitchen next to the tables and the families will be able to watch how their food is cooked. Bimini Road offers Caribbean food. The Point Salad Restaurant and Bar offers salads. Murray’s Deli, with its vintage diner decorations, serves hamburgers and milkshakes. Carmine’s is another family restaurant. Virgil’s BBQ is a rustic barbecue restaurant. This hotels has several large conference halls where guests will be able to celebrate events. There are several large conference halls and terraces where guests will be able to organize their events. The hotel is located on Paradise Island, near Nassau, with views towards the Caribbean. This resort recreates the kingdom of Atlantis. There are several lagoons with fish where guests will be able to relax. 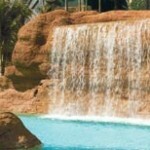 There are several swimming pools, pools for kids and pools decorated with fountains. Guests will be able to dive in the resort’s artificial lagoon and the hotels organizes snorkel trips to nearby coral reefs. The hotel has several golf courses and tennis courts. There is a club with a large multimedia room that offers activities for children. The spa offers massages. The hotel has one of the largest casinos in the Caribbean. Guests will be able to play cards and there are many slot machines and shows organized at the casino. Aquaventura is the resort’s water park. The park has more than twenty swimming pools and many themed rides. The pools and attractions are connected by an artificial river that has boats. The Dolphin Cay is a place where guests will be able to see dolphins, and there is a dolphin sanctuary nearby. Guests will be able to swim with dolphins. 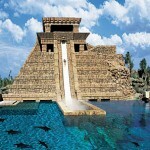 Next to the cay there is a a large water tank with sharks, and guests can swim with sharks. 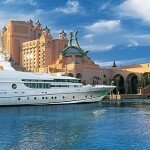 In the middle of the resort is the Atlantis island, which has many large aquariums with stingrays and exotic fish.